We are in the six month window of the big day. Where on earth did time go? The last nine months flew by so fast - I cannot imagine what the next six are going to be like. One thing we have been working on for months is our welcome bags. Since this is a destination wedding, all guests will receive a package at check-in. We wanted to have items in the bag which showed the New Orleans spirit while giving our guests a peek of the fun they would have over the few days spent in the big easy. The first thing we purchased was personalized cups. New Orleans does not have an open container law so we wanted to make sure our guests had a cup they could bring from bar to bar for their refills. 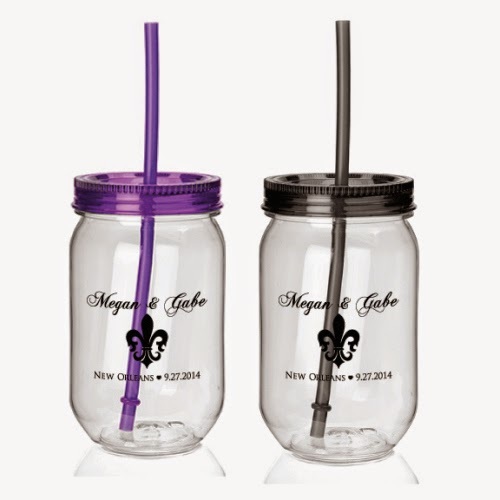 We decided on personalized plastic mason jars with a screw on lid and straw decorated with our names, a fleur de lis and the city/date of the wedding. Along with the cup, we wanted to provide our guests with items to help them the morning after. The ONLY store bought bloody mary mix I will buy is Zing Zang. Many moons ago, Gabe and I were both bartenders and pre-made bloody mary mix used to be something I turned my nose up to. That is until I was introduced to Zing Zang years ago. These days, I rarely make my own mix, because Zing Zang is perfect, just the way it is. 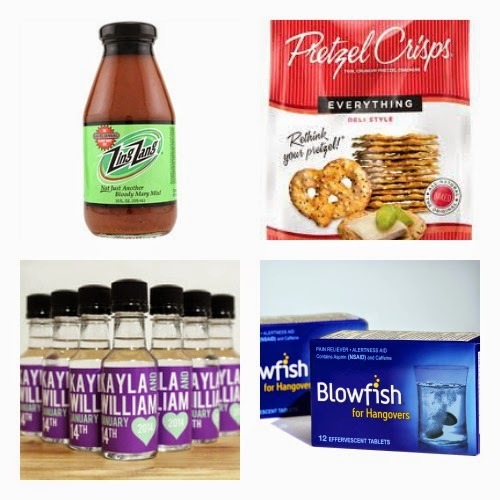 In our hangover kits, we will provide our guests with 10oz bottles. If I have a little too much fun the night before, there are few things I can eat. Pretzels are an item that helps me feel like a normal human being. My choice? Pretzel Crisps Everything flavor. At only 110 calories per serving, these wont hurt your diet. Finally last but certainly not least - Blowfish for Hangovers. I was introduced to this product last year from a Klout perk. It really works. Not only have I tried it but Gabe and my best friend Keri also put their seal of approval on the miracle hangover remedy. Along with the items above, we will be throwing a few additional New Orleans treats in the bag. We are absolutely including pralines. I haven't yet decided if we will get them personalized or not. You also can't go to New Orleans without getting beads. We live in Ybor City and there are a few parades through the year with mardi gras style floats and more beads than you could even imagine. 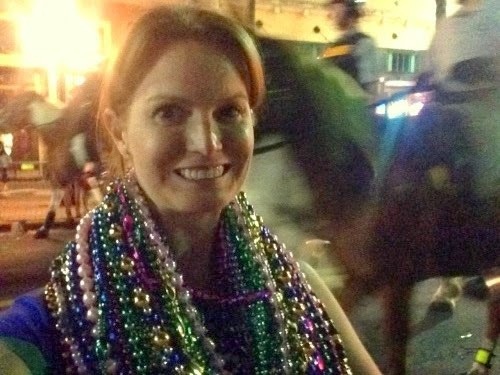 Even prior to knowing we would get married in NOLA, I've held onto the "deluxe" beads. The "budget" beads would be tossed or handed to kids if they were around. Many parades later, we have over 150 higher quality beads we will include in our welcome bags. The photo above was from the 2014 Ybor City St. Patricks Day Parade. Did you have welcome bags at your wedding? If so, what did you put in them? Ice Plant Bar - St. Augustine.